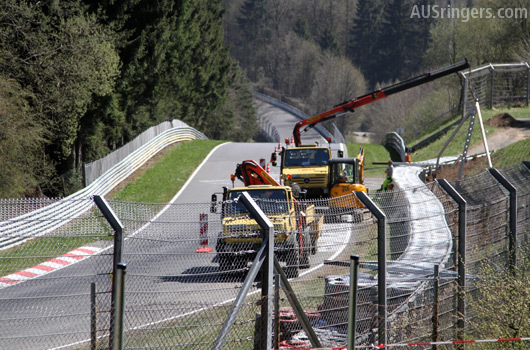 AUSringers.com » Huzzah, Nordschleife speed limits to be lifted! Nürburg, 18. August 2015. The Nürburgring’s legendary Nordschleife is to be made even safer, and speed limits are to become a thing of the past as of 2016. At a round table on “safety on the Nordschleife”, capricorn Nürburgring GmbH (CNG) presented a comprehensive set of measures to representatives of the German motor sport association DMSB, the ADAC, the automotive industry, the organisers, teams, drivers and the region, finding wide approval. In the next step, an official application for renewal of the circuit approval, which is set to expire according to schedule at the end of the year, will be submitted to the International Automobile Federation FIA via the DMSB. A serious accident during this season’s first VLN Endurance Championship Nürburgring race at the end of March, in which a spectator sustained fatal injuries, triggered discussions about safety, as well as the unusual move of introducing speed limits on a race track. The safety of spectators in particular is the focus of the planned installation of additional safety fences in several track sections and a restricted zone in the Schwedenkreuz area. In order to increase passive safety, lines of protection are to be optimised by installing additional guardrails and FIA safety fences, for instance along the Döttinger Höhe section to better protect the adjacent federal road. The renewal of the track surface, as a first step in the track section Flugplatz, will serve to increase active safety on the Nordschleife, which was opened in 1927. “Based on detailed measurement, we will renew the track surface in the Flugplatz section over a length of about 500 metres, smoothing out five bumps which are the result of years of high utilisation and heavy use of the Nordschleife,” Carsten Schumacher explains. Starting from November until the beginning of the 2016 season, seven of the 16 measures planned are to be implemented. “The unique character of the Nordschleife will be preserved. That’s not only important for motor racing but also for the industry, which has been testing its vehicles on this unique race track for decades,” says Carsten Schumacher, who also banks on additional technical measures on the part of the carmakers. On behalf of the 22 experts at the round table hosted by the Nürburgring, DMSB president Hans-Joachim Stuck, who was unable to attend in person, explained: “All parties want to preserve the Nordschleife and its uniqueness. However, we all know that we will have to improve safety. To this end, the Nürburgring as track operator has worked hard to devise a set of effective measures in great detail which met with broad approval at this round table.” The participants also spoke in favour of successively implementing the measures in the next few years. The Nürburgring will now submit the catalogue of measures presented to the German motor sport association DMSB in the form of an application, to be forwarded to the Circuit Commission of the International Automobile Federation FIA.